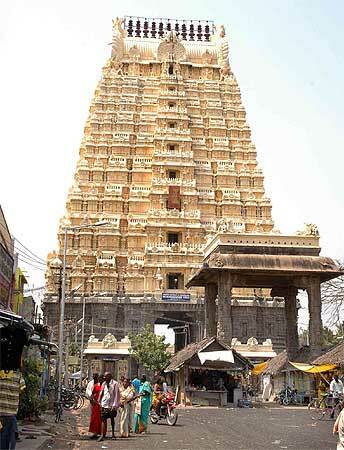 Kancheepuram is known for its silk and temples. Shobha Warrier and photographer Sreeram Selvaraj do an electoral reality check in the temple town. The All India Anna Dravida Munnetra Kazhagam may have woven a formidable electoral alliance in Tamil Nadu, but one of its staunchest support groups -- the weaving community -- is not happy with the party. Welcome to Kancheepuram, the temple town, where the weavers's votes could make a difference to the outcome. Kancheepuram -- also called the silk town -- was part of the Chengalpattu Lok Sabha constituency until this election. Thanks to delimitation, the Kancheepuram constituency came into being. With six assembly segments, it has 1,057,422 voters (531,593 men and 525,829 women). Traditionally an AIADMK bastion, Kancheepuram has the Congress's P Viswanathan, the AIADMK's E Ramakrishnan and actor Vijayakanth's Desiya Murppokku Dravida Kazhagam party's P Tamilvendan in the fray. 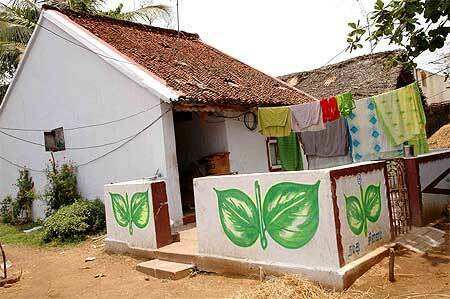 Almost every home in the weavers's colony in Kancheepuram is painted with two leaves, the AIADMK party symbol. But that does not mean every vote will go to the party's kitty this time. Disillusionment and political apathy are evident in the constituency. Lack of infrastructure, price rise and power shortage are the main concerns. Admits DMK supporter Sudarshan, a priest, "Being a Brahmin, I should have been supporting the Congress candidate, but I will not. That is mainly because of price rise. How do you expect us to live, buying rice for Rs 30 (a kilo) and dal for Rs 50? 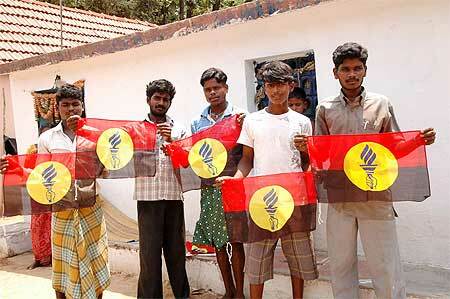 The DMK government gives us rice for Re 1, but nobody can eat it." Image: The writing is on the wall. "Life has been tough," says R Chandrasekharan, who sells goods on instalments. "I hold the state and central governments responsible for this," he says. "We don't have roads, power and water. And if anything is available, it is too expensive," adding that he has been struggling to make both ends meet for the last year. Money, many voters say, is a big factor on Election Day. Explains a voter: "No money has come to us so far! Many people wait till 4.30 in the evening on polling day to see who gives the most money. They collect money from all parties and vote for the person they like." "Everybody feels if these politicians can make crores (tens of millions) in five years, why don't they distribute a part of it to the poor? Their assets have doubled and trebled in five years, but our life remains the same!" 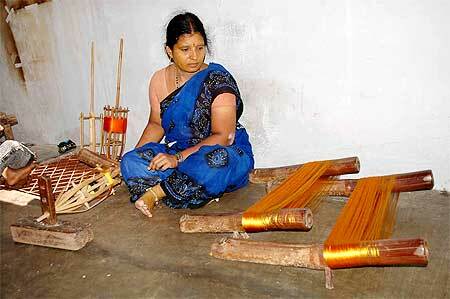 In Kancheepuram -- the home of exquisite silk -- weaving is dying. 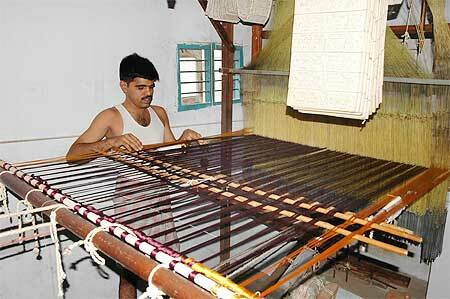 Political parties have done little to revive the tradition or tried to help distressed weavers. Many weavers have abandoned their craft. Once adept at weaving, Sudha, Malai, Kamala and Padma have become construction workers. "What can we do? Do we have any other option? With just Rs 2500 (a month), how can we send children to school and survive? 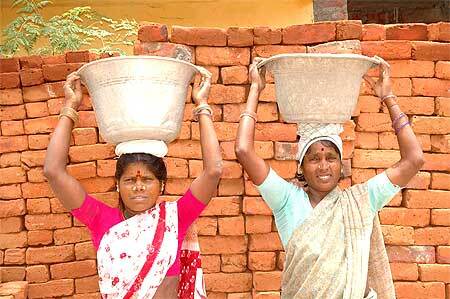 If we work as construction labourers, we get Rs 150, Rs 200 every day. But there is not work every day." We do not want our children to be weavers. We want them to study and have a better life," they say. That is why 15-year-old Anjali has decided to be a policewoman. "I will study," she says. "I will not be like my mother." Is the problem of Sri Lankan Tamils an important issue among the weavers and the neighbouring Dalit colony? "When we are struggling to live, where is the time to think of Sri Lankans?" asks weaver Sudheendran. "It is only an issue for politicians, and not for the people. Our earnings have dropped by 50 per cent in the last one year. To whom will I complain? We thought of stopping all this, but what will we do? We do not know any other job." Amid all the gloom, one man has emerged as an inspiration for many in Kancheepuram: DMDK chief Vijayakanth, who is affectionately called 'Captain' in Tamil Nadu. "The 'Captain' is our hope. Have you seen him speak? He tells us we should unite for a change, and we will. Only the youth of this state can bring about a change and we will. 2011 assembly election is our target."